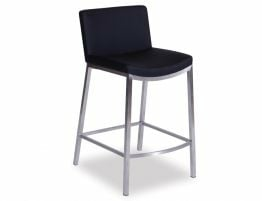 The Addison Breakfast Bar Stool’s frame is made of premium grade brushed stainless steel giving it a modern aesthetic that works well at your kitchen counter. 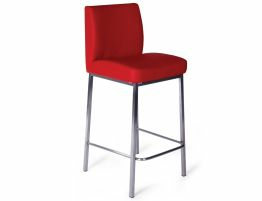 This bar stool is also an economical choice if you are looking to update your restaurant stools, the stainless steel construction lends the Addison an expensive and sturdy feel. Protective pads at the base of each leg prevent scratching your floors. 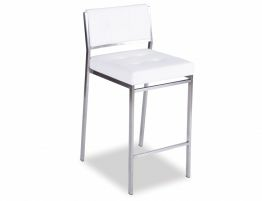 The Addison will complement a number of different styled rooms. The sleek, tuxedo black upholstery over a plush cushioned seat and back lend softness to this modern bar stool. The chic black faux leather upholstery works well with monochromatic, black and white design and bright modern colour trends. The supple, black material is impeccably constructed and easy to care for. 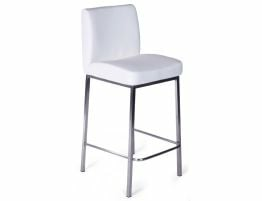 The material wipes clean, the frame is sturdy, well made and stands up to regular use making the Addison Bar stool suitable for high traffic kitchens or busy restaurants. 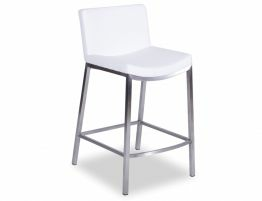 This standout Addison Breakfast Bar Stoolwill pair perfectly with your modern stainless steel appliances.